Whether you’re into getting to know local art scenes in buzzing cities, spotting the big five on safari, or getting to know South Africa’s rich and complex history, this country has something to offer everyone. Here’s out list of 10 attractions you just can’t afford to miss. Located in the famous Orlando West district of Soweto, Johannesburg, the Hector Pieterson Memorial and Museum commemorates Hector Pieterson, a 13-year-old black South African who was shot dead by police during the Soweto Uprising on 16th June 1976. Pieterson was the subject of a famous photograph which came to symbolise the brutality of the racist apartheid regime. Nearby, you can also check out Mandela House, the former residence of freedom fighter — and possibly the world’s most famous South African — Nelson Mandela. One of the oldest mountain ranges in the world and highest in southern Africa (measuring 3,482 metres), The Drakensberg in Kwa-Zulu Natal province is not to be missed. The Northern Drakensberg in particular has a lot to offer, home to breathtaking cliff-face The Amphitheatre as well as Tugela Falls. Activities in and around The Drakensberg include visiting vineyards and wine tasting. You can also take hikes where you can spot antelopes, black wildebeests, some of the hundreds of bird species and, if you’re really lucky, white rhinos. If you like your travel on the more extreme side, you can abseil and rock-climb off some spectacular cliff-faces. You might have been to many an aquarium in your time, but trust us, Two Oceans Aquarium in Cape Town is a really, really impressive one. They’re also ethical, having recently released their large ragged-tooth sharks into the wild. 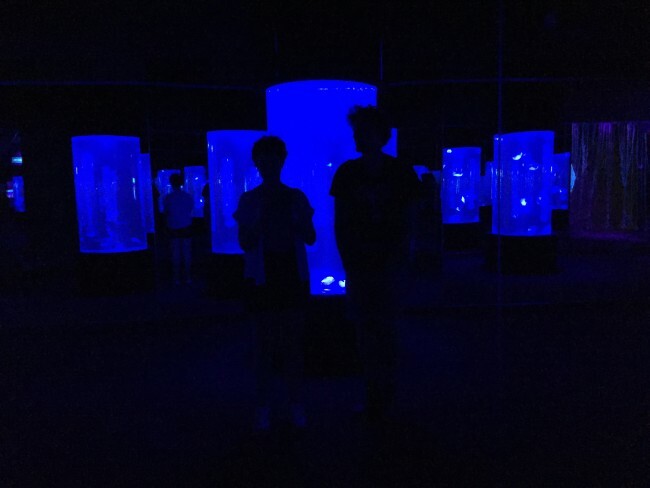 Hang out in the trippy neon jellyfish room, have one of the staff talk you through barnacles and sea cucumbers in the Microscope Exhibit, and go along at either 11.30 and 14.30 to catch feeding times with the African penguins. Getting to hang out in the cooler-than-cool district of Maboneng is just one of the many reasons to visit the enthralling city of Joburg. Catch a show at the POPArt: Theatre, pick up some wares at Market on Main and Arts on Main, eat pizza while watching a film at indie cinema The Bioscope, or party at rooftop bar The Living Room and get a feel for life as a trendy Joburger. Don’t forget to check out the 40-metre mural of Nelson Mandela, painted by artist Ricky Lee Gordon shortly after the death of the national hero. An absolute must for anyone visiting Cape Town, The District Six Museum pays tribute to the city’s dark history through photographs and artefacts. District Six was an area originally established as a mixed community, but forced removals and systematic marginalisation of non-whites in this vibrant district began at the beginning of the 20th century. In 1966 it was declared a white-only area, and by 1982 more than 60,000 people were forcibly removed to barren areas in the Cape Flats. Located by the border with Botswana (another country well worth a visit, FYI! ), is Madikwe Game Reserve. As one of South Africa’s lesser-known parks it calls itself a ‘hidden gem’ — and it’s not wrong. Visitors can opt to stay nearby or within one of the park’s luxury or community lodges, and can expect to see the Big Five in this 680-kilometre park. The park is also known for its conservation, including work to protect the highly endangered African wild dog. While you’re there, it’s also worth checking out Bopa Monyetla, a local charity who work to engage the local community by training young people in conservation. Soak up Indian culture… in South Africa. A great example of South Africa’s incredible diversity of cultures, Durban’s Indian population are loud and proud. The alluring Indian Quarter is part of the city’s daily hustle and bustle, but in among it you’ll find amazing curry houses, tea rooms and shops selling anything from spices to fabric — don’t miss the impressive Victoria Street Market. The mosque is also well worth seeing. This small town in Western Cape has it all if you’re looking for nature — beautiful beaches to chill out on, mountains to climb, rivers to canoe down and ancient forests to explore. It also has its fair share of farm shops selling fresh and delicious local produce, from gourmet cheeses to cured meats. You can also check out Birds of Eden, an impressive two-hectare dome spanning over a gorge of natural forest — making it the largest free flight bird aviary in the world. Home to more than 3,500 birds, the sanctuary aims to create a safe environment in which to release African birds back into the wild. A visit to artsy Joburg wouldn’t be complete without visiting one of the city’s many art galleries. Aside from discovering smaller spaces in areas like Maboneng, you should also check out Johannesburg Art Gallery, the continent’s largest. Home to 9,000 works of art displayed in 15 exhibition halls, JAG ensures you’ll need at least half a day to get the most out of it. Highlights include works by the likes of Gerard Sekoto, Alexis Preller, Maud Sumner, Sydney Kumalo and Ezrom Legae.